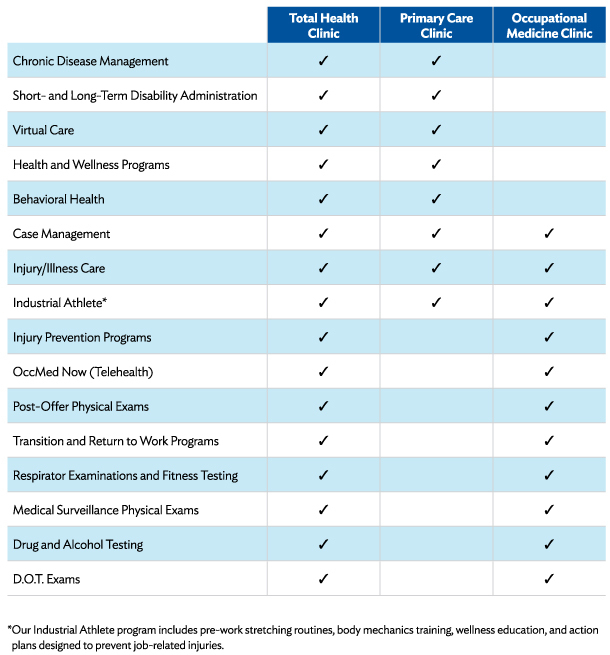 UnityPoint Health at Work will work with you to customize the right medical providers and mix of services to meet the needs of your company and your unique workforce. While a Total Health Clinic provides the greatest opportunities for health improvement, employee engagement and return on investment, you may wish to focus on either primary care or occupational medicine, with the opportunity to add additional services over time. Our employer-based health programs are provided by trained and certified medical professionals who understand your business and will provide the highest level of care for your workforce. Our staff understands different types of work stressors and can implement specific programs to keep your workforce healthier as well as more productive and engaged. Our access to licensed, professional providers is unmatched. Backed by the resources of UnityPoint Health, we can match our providers to your exact requirements. UnityPoint Health at Work brings the entire healthcare resources of UnityPoint Health and other allied healthcare professionals to your business. See how UnityPoint Health at Work can work for you.